At ABC Dental of Peabody, we take pride in helping your child improve their oral health in every way we can. We take the time to teach your child about oral hygiene and preventative care in addition to the dental services we provide. By teaching your child how to take care of their mouth, we seek to help to improve your child’s long-term oral health. When you make an appointment for your child, you can expect us to cover a range of dental services to evaluate your child’s overall oral health. 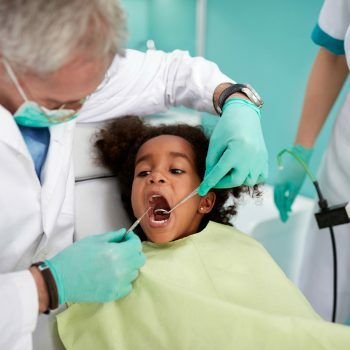 We will inspect their mouth, looking for any signs of tooth decay, gum disease, bite or jaw problems, or other dental needs such as tooth restorations and fluoride treatments. The main goal of dental examinations is to find any problems and address them accordingly, therefore, we are thorough in each exam, making sure to catch any problems and find the best solution in a timely manner. Taking dental x-rays help us to identify any problem areas that the eye might not catch and also help in deciding if your child will need braces later on. The cleaning portion of your child’s appointment will help us to get rid of built-up plaque, tartar and other stains on your child’s teeth. Having thorough cleanings twice a year will help your child grow strong, healthy teeth as they get older. Even if your child brushes and flosses often, some plaque and tartar build-up is unpreventable but frequent cleaning treatments will take care of this problem. By ridding of plaque and tartar, we will limit the amount of bacteria in your child’s mouth which is essential to their oral hygiene. Scheduling dental exams and cleanings for your child every six months will help your child to have a healthy, happy mouth. ABC Dental in Peabody, MA offers comprehensive dental services to children including routine dental exams and cleanings. Contact us today to schedule an appointment for your child!